What to do if you have unerupted canine? When a tooth fails to emerge through the gums, it is considered to be an impacted tooth. This commonly occurs in the case of canine teeth. It is important to treat an impacted tooth in order to prevent the improper eruption of nearby teeth, cyst formation, possible infection or other negative changes in the jaw. What’s involved with unerupted canine? The first option is for dentist to expose the tooth in order to allow it to erupt on its own. Once the surgery is completed, your dentist may place a protective dressing over the surgical site while it heals. This method will allow the canine tooth to emerge until it is at the level of the adjacent teeth, after which the teeth can be aligned with braces. 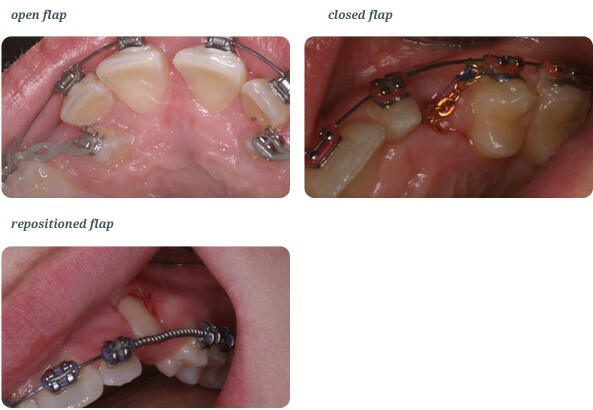 The second option is for your dentist to expose the tooth and then attach an orthodontic bracket to it. Either at the time of surgery or shortly after in order to help guide the tooth to the level of the adjacent teeth. If stitches were used during your surgical procedure, you may need to have them removed 1 to 2 weeks post-operatively. Regardless of which treatment you have received, you must avoid chewing on the surgical site for 2 weeks following your surgery. You will be issued with detailed post- operative list. Please note that this photo has not been enhanced and has been used with the patients permission. Having healthy teeth and gums is the best investment you can make. Once you have met our team we will provide you with a cost based on the agreed treatment plan. We will also discuss if you need sedation and if the treatment is extensive you may need our overnight package. We can also discuss various methods of payment to suit you. The treatment was professional and more important painless. Dr Lee Kin at all times carried out the treatment with great clinical expertise and greatly merits his reputation as a dedicated and skilled practitioner.